When our boys were born we were very grateful for all the meals friends brought over for us. On days when it’s hard enough to find time for a shower, let alone cook, having someone else prepare a meal for you is such a treat. Most people brought us dinners, which was awesome, but Andy’s law partner’s wife has made us breakfast twice. Both times, Andy’s partner has dropped it off early in the morning, so it was waiting on the porch for us when we finally made it downstairs, which I thought was a really sweet idea. Recently, a friend had a new baby girl, so I decided to bring them breakfast too. I wanted to bring them something homemade and semi-healthy, so I decided to make them homemade yogurt, with a blueberry compote and homemade granola. 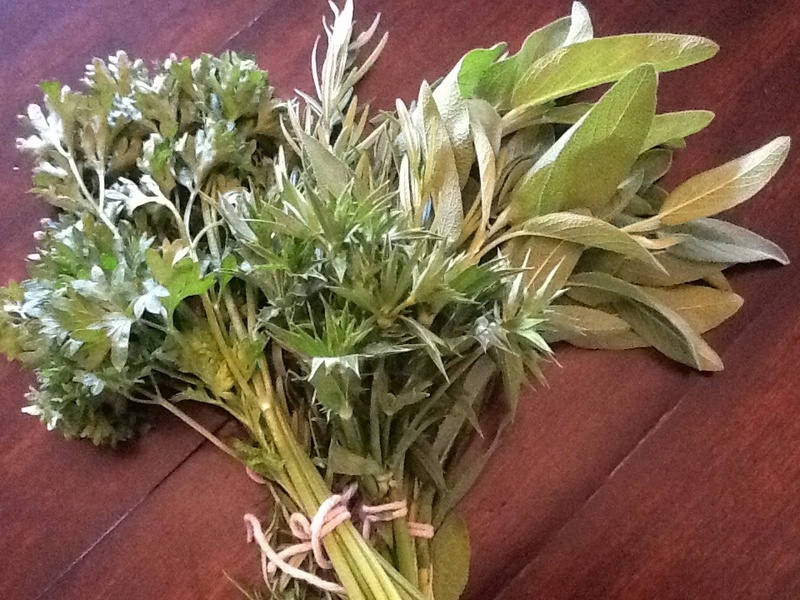 Lucky me, my efforts were rewarded with some beautiful bunches of herbs as a thank you. One of the herbs in the bunch were spiky culantro flower heads. Although, the leaves are usually used in a variety of Asian, Latin and Carribean dishes. The flowers worked nicely shaken in a gin and vodka martini with cucumber, lime, simple syrup and a little fresh bird’s eye chile. But, back to the breakfast…I will be posting on my method for homemade yogurt making soon, so stay tuned. In the meantime, I will share with you my source for what I think is THE BEST homemade granola and my recipe for blueberry compote. The granola is a recipe from the wife of Michael Symon of Food Network fame. Turns out Lizzie Symon is pretty handy in the kitchen herself. Her granola is chock full of nuts and fruit and tends a little on the sweet and salty side, which I love. It has a reasonably generous amount of olive oil, but hey, that’s a healthy fat, right? And it’s sweetened with honey, so I am pretty sure that means the calories don’t count. My blueberry compote is really an adaptation on blueberry pie filling. I even bake it like pie so that the juices can reduce and get all thick and sticky, while keeping most of the blueberries whole and intact. 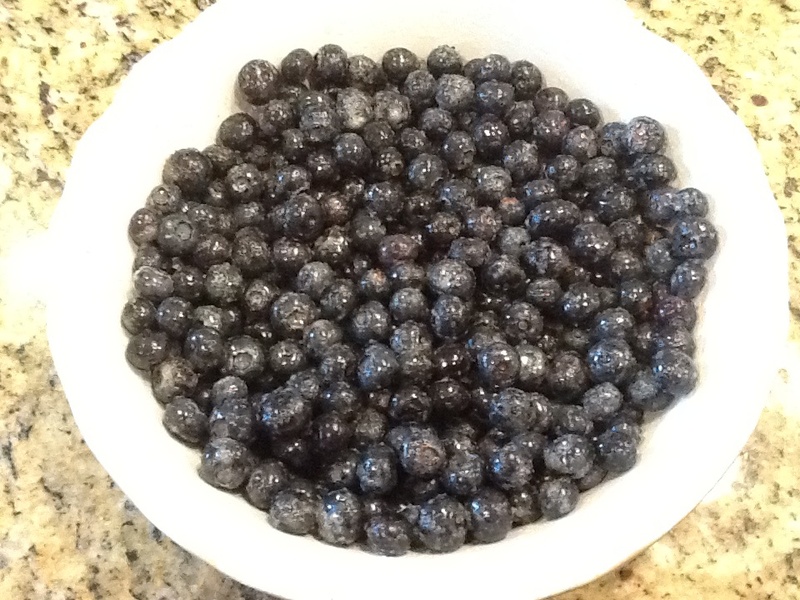 In a pie pan gently combine the blueberries, sugar, cornstarch, lemon juice and almond extract until the cornstarch is incorporated and the blueberries are coated. Cover the pie pan with foil. (This mimics a pie crust.) 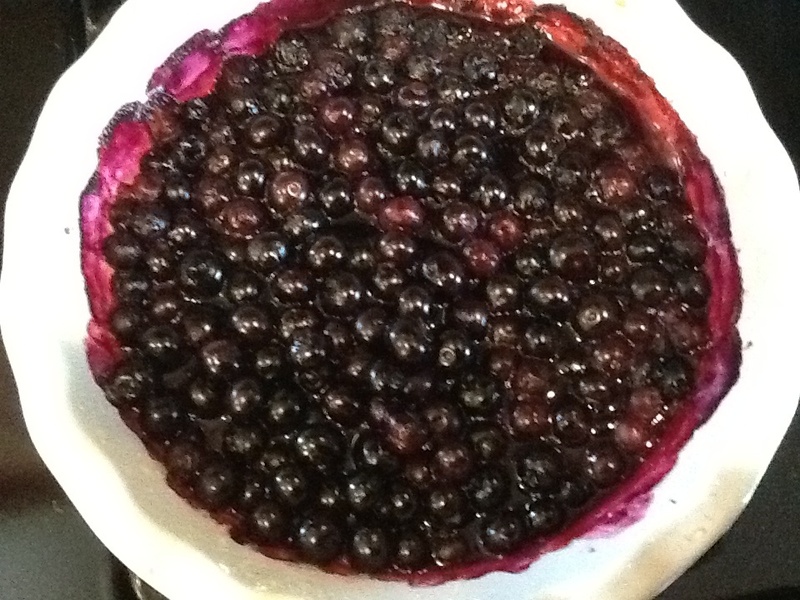 Bake about 40 minutes, until the juices have started bubbling, but before too many of the blueberries have burst. To verify it’s done, taste a spoonful and verify the starchy taste and texture has cooked out of the cornstarch. If you want, you can eat the warm compote right away (perhaps over ice cream, on top of waffles, or slathered on a scone), but if you plan to bring it to a friend’s house, or want to eat it later, allow the compote to cool completely, then spoon it into a pint-size container (I used a canning jar).